Hello Everyone, welcome to Day 1 Winnie & Walter January Release 2015! For today I am sharing the font that we all came to love. Another installment of the famous The big and the bold sentiments for this release its all about celebration. The Big, the Bold and Party stamp sets with its Coordinating Cutaways that will be Available for purchase on January 30th. To begin my card I cut a 6 1/2 by 4 inches card base and distress all sides with Distress ink in Wild Honey and Picked Raspberry. I then cut a white cardstock for the front panel of my card and stamped the images, some I stamped on a separate white cardstock fussy cut then distress. Next, I stamped some of the dot images from Scenery: Big Bang Confetti stamp set. 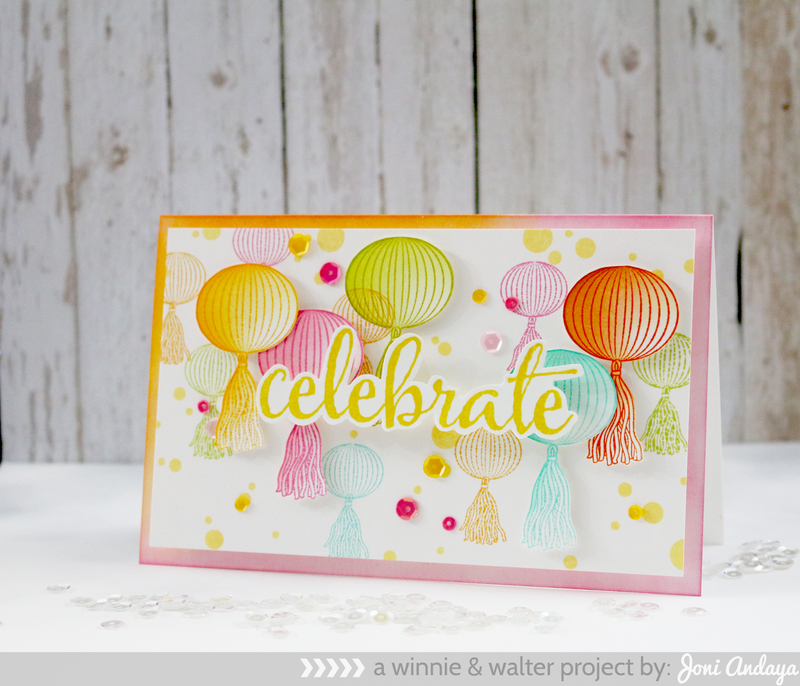 For the sentiment "Celebrate" I stamped it on a white cardstock, fussy cut, and adhere on the middle of the card. To finish it off I added some Pretty Pink Posh sequins in Marigold, Sweet Blush, and Pretty Peonies in 4mm/6mm. Just when I think you couldn't possibly amaze me yet again...YOU DO!!! Wow Joni...just WOW!!! Super FUN card, Joni! Love it! Gorgeous card Joni! Your colours are a delight! I'm looking forward to W&W release! So gorgeous! LOVING the lanterns!!!!!!! Oh, so pretty, Joni! Your fussy cutting is amazing! Dear Joni, your card is soo beautiful! 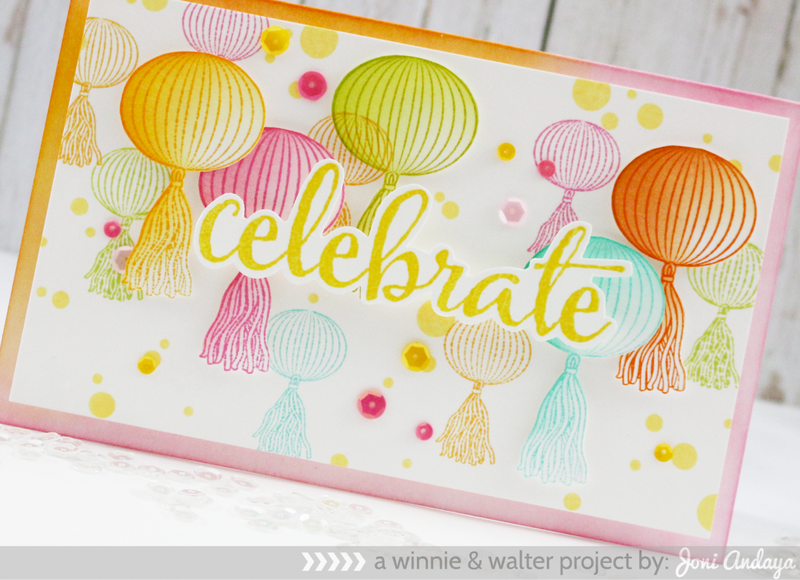 I l♥ve your style of cardmaking so much and your color combos are every single time so wonderful! Beautiful card. Love this design. This is gorgeous, Joni! So bright and happy! I LOVE your inked background, and love all the color here. It's vibrant, and soft, all at the same time. Beautiful! Oh so dreamy and beautiful!! Wow...those lanterns are AMAZING!! Beautiful card! !